Conservation status: Archaeology monument of state importance No.2294, architecture monument of state importance No.6810. Livonian order built Jaunpils castle to defend southern borders. Most likely the castle is built at the other half of 14th century. In the end of 16th century, when collapsed Livonian order, castle fell in hands of former komtur (commander) of Dobele - Recke - and family of Recke managed to retain the castle until 1920. 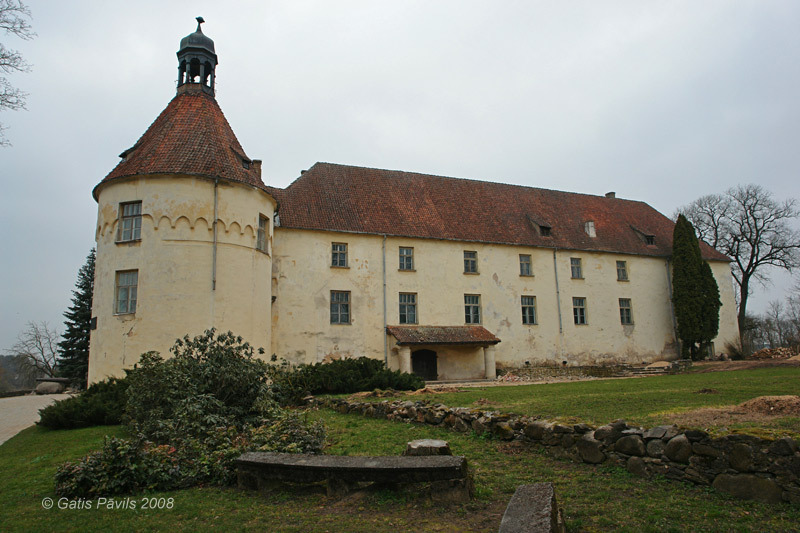 Castle has been rebuilt in medieval times and in 17th century - but in general it did not change significantly until the fire during the revolution in 1906. In 20th century castle has been reconstructed two times - but it still has got ancient medieval feel. 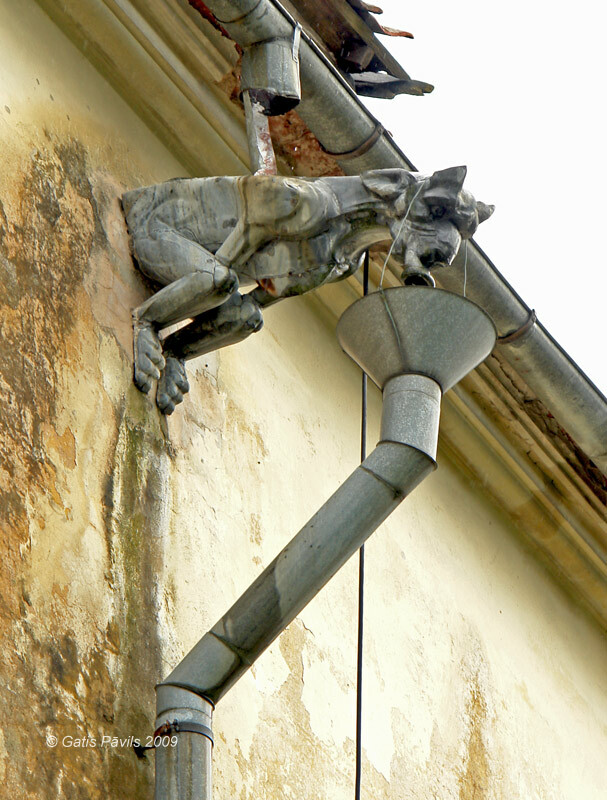 In German most often called - Neuenburg. In 1411 it has been mentioned as Nuwenburg, later - Nienborch, Neyenburg. 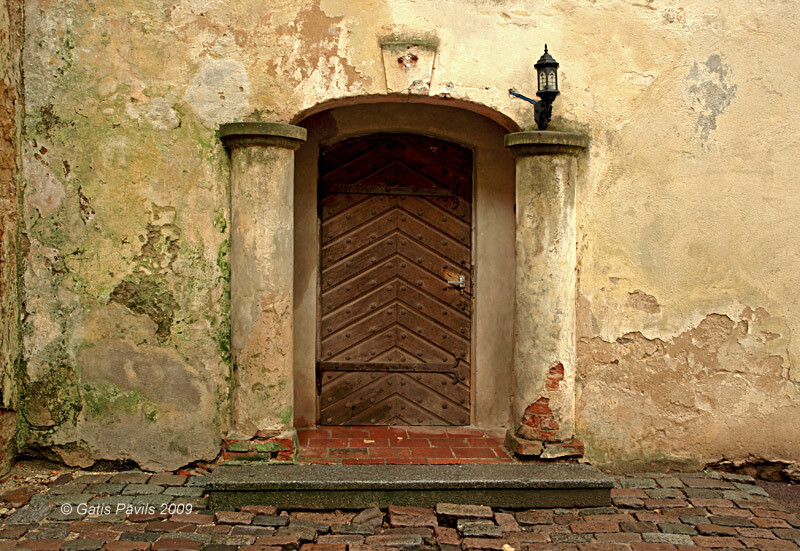 In Latvian its present name means - "the new castle". 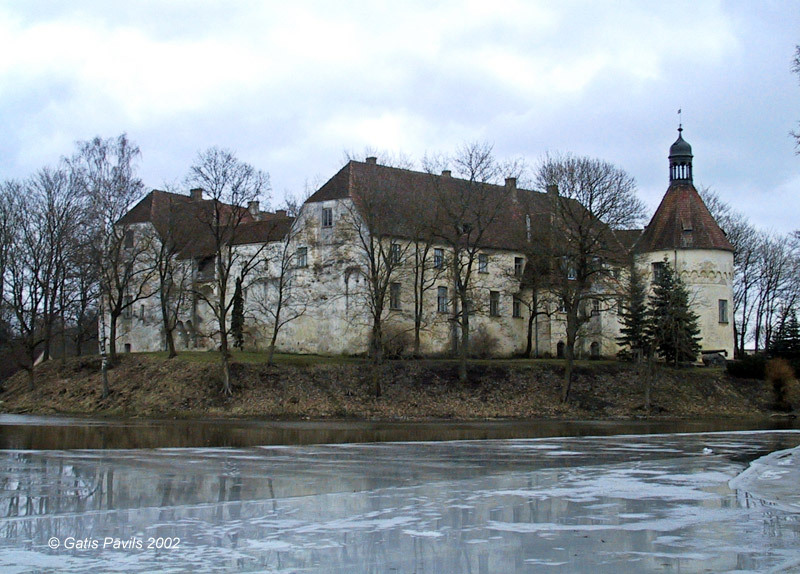 Jaunpils medieval castle - view from the west across the millpond. 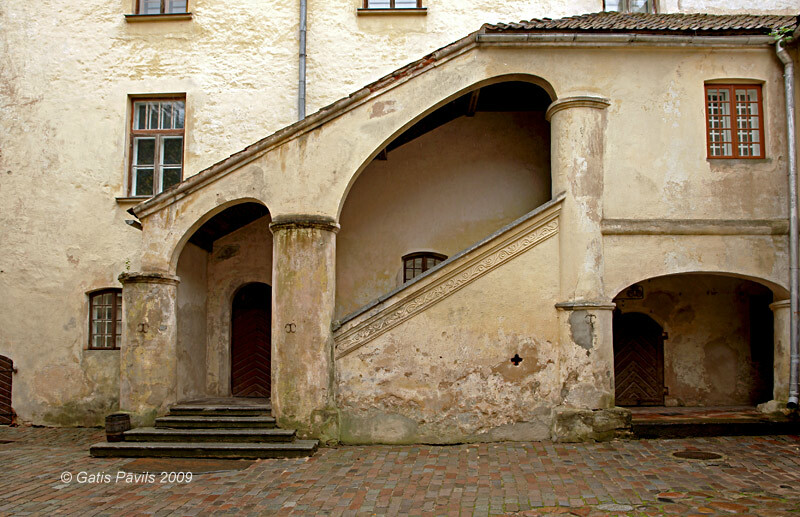 Jaunpils developed as a household castle for Dobele Komturei (commandry) and as an administrative centre of region. Exact year of the construction of castle is not known for sure - although in tourist booklets there often is mentioned 1301. This year initially was mentioned in the work of J.G.Arndt (1753) without any reference to original sources. Livonian order was involved in war with Riga in 1301 and it is little likely that in this time were built any new castles. 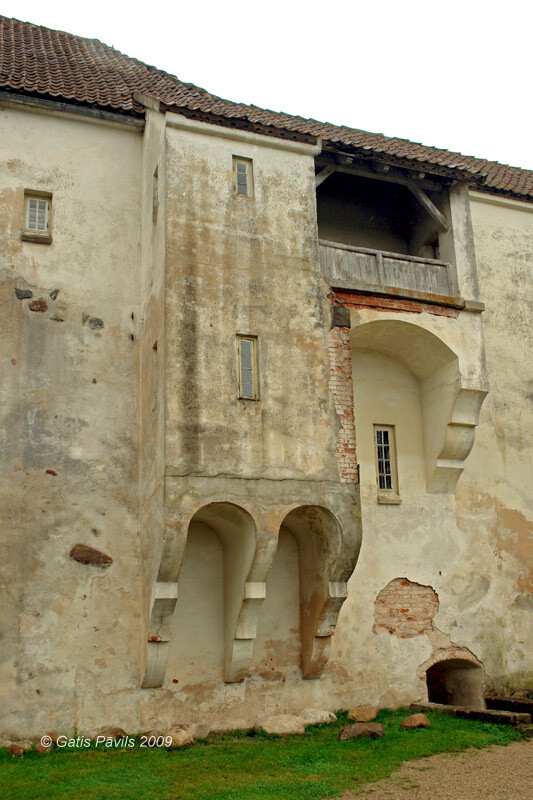 As a castle Jaunpils is first mentioned in the list of Livonian castles from 1411 as Nienborch - thus some researchers consider that it is built only in the beginning of 15th century. Castle together with other castles in Jelgava, Dobele, Saldus and Skrunda formed a defensive line, protecting against the invasion of Lithuanians - order already in 1339 built a castle in Tervete with such intent and Lithuanians demolished it in 1345. It is possible that because of these events there was built Jaunpils castle further inland - thus most likely it has been built in the second half of 14th century. 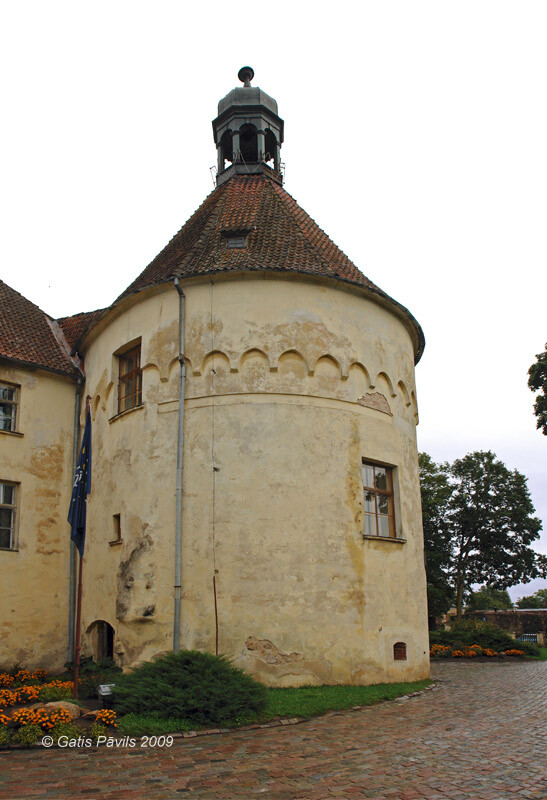 There is scarce information about the castle in times of Livonian order. Already in 15th century fortifications were modernised, at the south-western corner there was built a massive round tower. 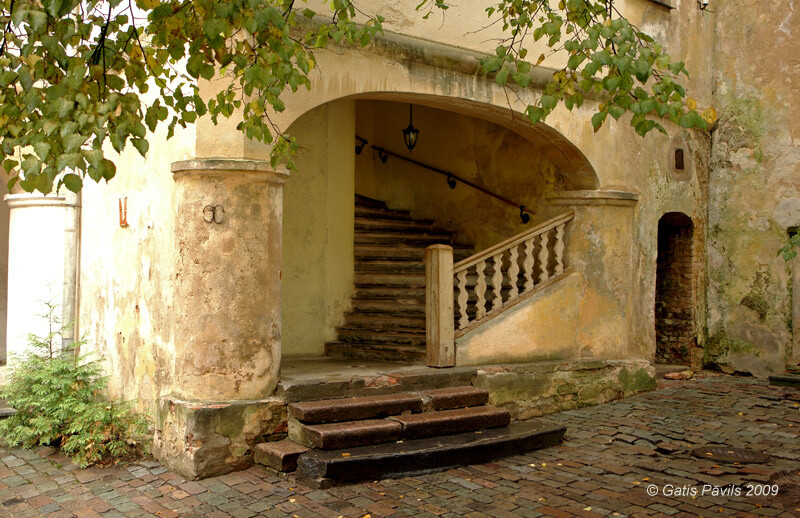 In the beginning of 16th century there were relocated elderly, disabled brothers of order to Jaunpils. In 1548 in the castle there was built a chapel. On 18th february 1576 the last komtur of Dobele - Ties von der Recke took over Jaunpils castle and its region with 14 manors. This happened through a conflicting with duke of the recently established Courland and Semigallia Duchy Gotthard Kettler - the later took Dobele Castle with force. Ties von der Recke died in 1580 and there were no major changes in castle in his time. 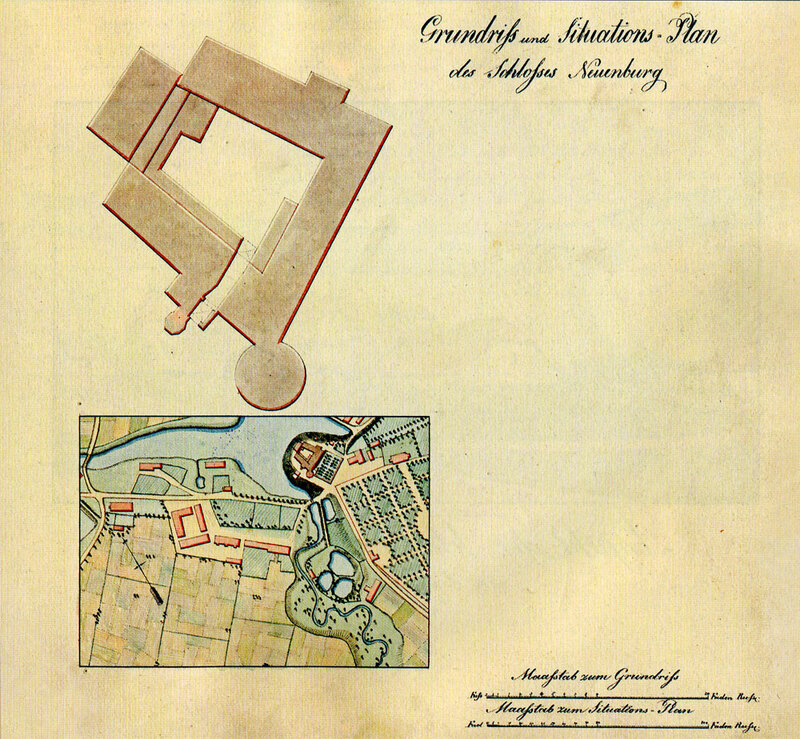 Plan of the central part of Jaunpils in the beginning of 19th century. 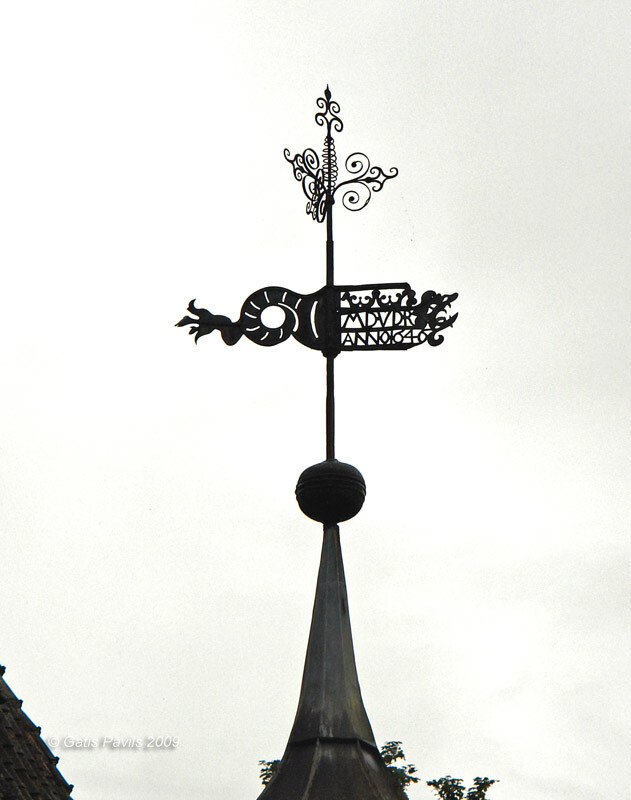 Weather-wane on the gate tower of the castle may show the time of larger rebuilding of the castle - it bears number "1646" and initials MDVDR - most likely initials of Matthias Dietrich von der Recke (1608-1652) - the castle was rebuilt during his governance. 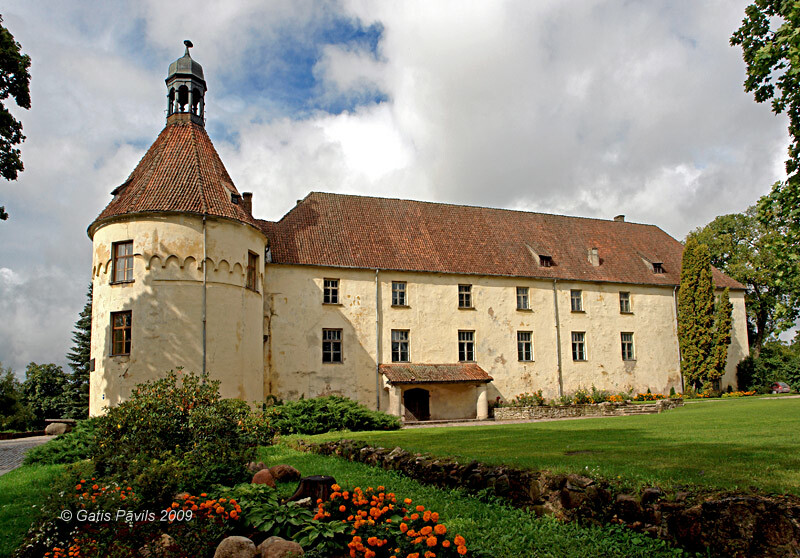 During these rebuildings the medieval castle was reshaped into residence of rich country nobleman. Outside the defensive walls at the north-eastern wall there was built a new apartment block, both existing blocks got third floor, at the north-western block there was added kitchen house. Apartments were decorated. During the Great Northern War the castle was used as a camp of war prisoners - high defensive walls prevented escape. One member of Recke family - Elisabeth Charlotte Constantia von der Recke (1756-1833) was active in the field of literature and well known in Europe. Her marriage to materialistic owner of Jaunpils castle - Georg Magnus von der Recke - was unhappy and they divorced in 1776. 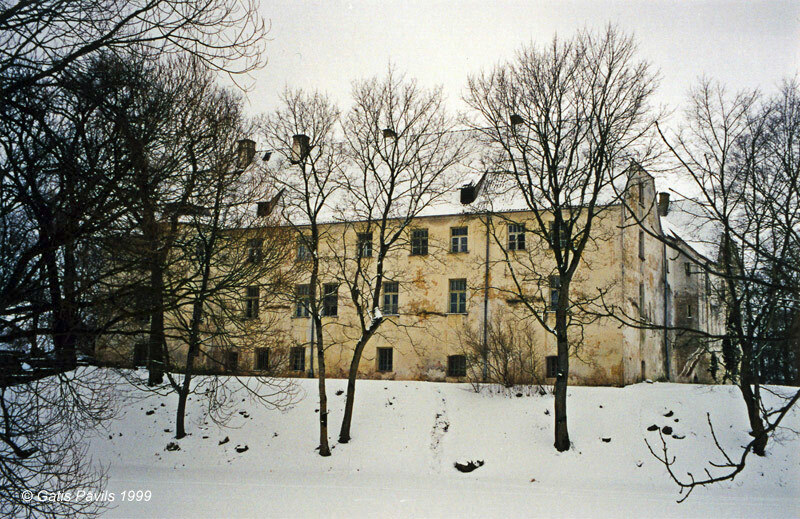 After the divorce Elisabeth moved over to Gluda manor, close to Jelgava. Later she moved abroad. Among her friends were Garlieb Merkel, I.Kant, J.W.Goethe, F.G.Klopstock and many other renovned public figures. Recke family started breeding pedigree cattle and this tradition was sustained in Jaunpils in 20th century after Reckes left, also in Soviet time. Castle itself survived until early 20th century without significant change. 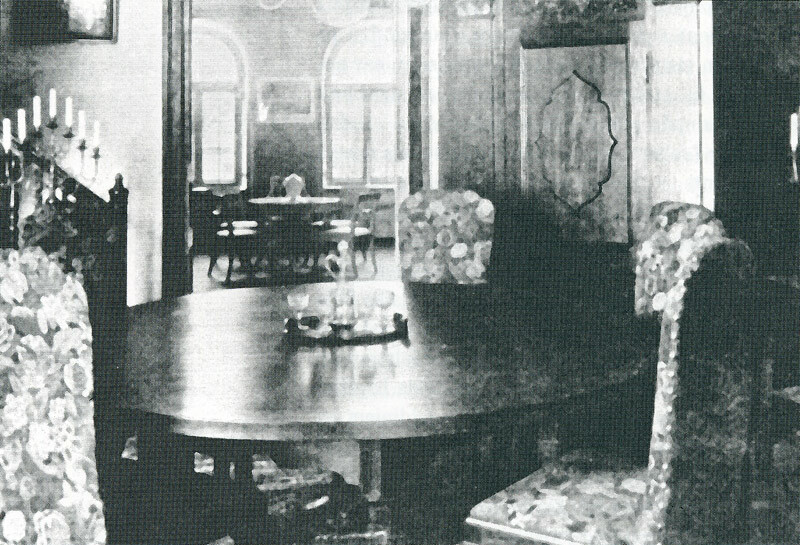 Dining hall in Jaunpils castle. 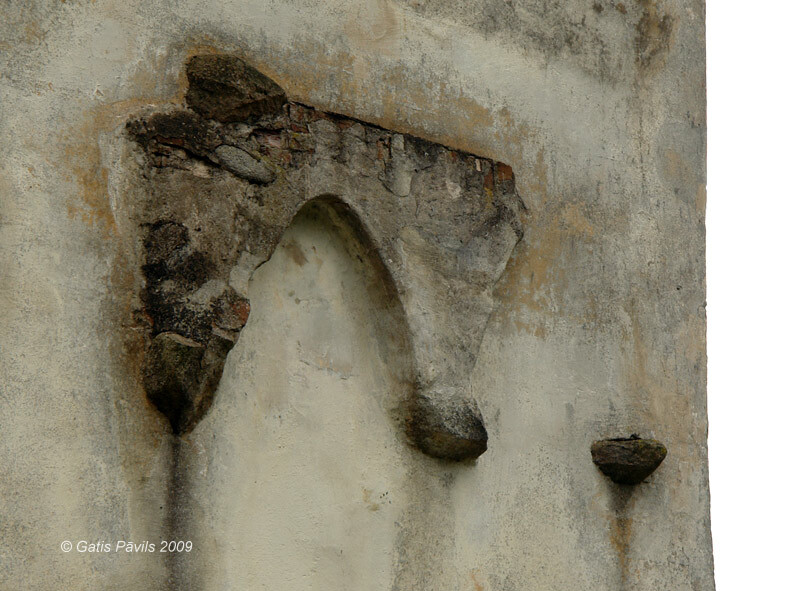 In 1906, during the night on 6th January the castle was set on fire by revolutionaries - thus perished one of the most authentic medieval castles in Latvia. Reconstruction started soon after and in 1906-1907 the castle was renewed according to design of architect W.Bockslaff and supervised by him. There were created new interiors as well. It was impossible technically to return the interiors of early 18th century - interior designer Balthasar von Campenhausen used simplified barocco style elements. Family of Recke owned the castle until 1920. In 1922 the Pedigree Cattle Breeding Station started to work here. In 1927-1940 here was located also Jaunpils Livestock Breeding school. During the Second World War here was located a hospital of German army. In 1960ies there was extensive rebuilding in the castle, interiors were modernised in contemporary style, ignoring the principles of monument restoration. 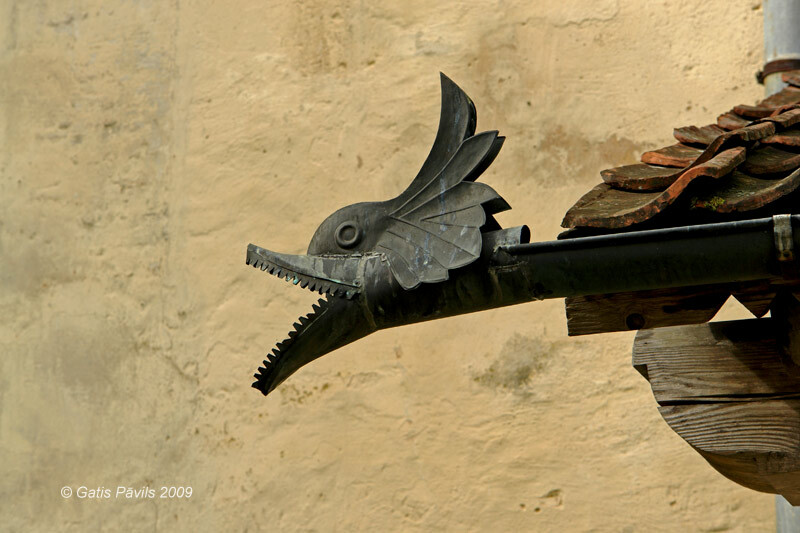 Since 1961 the castle is property of Jaunpils municipality, it serves as a culture centre, museum. Surroundings of the castle and the building itself is gradually brought in order. Plan of the centre of Jaunpils village. 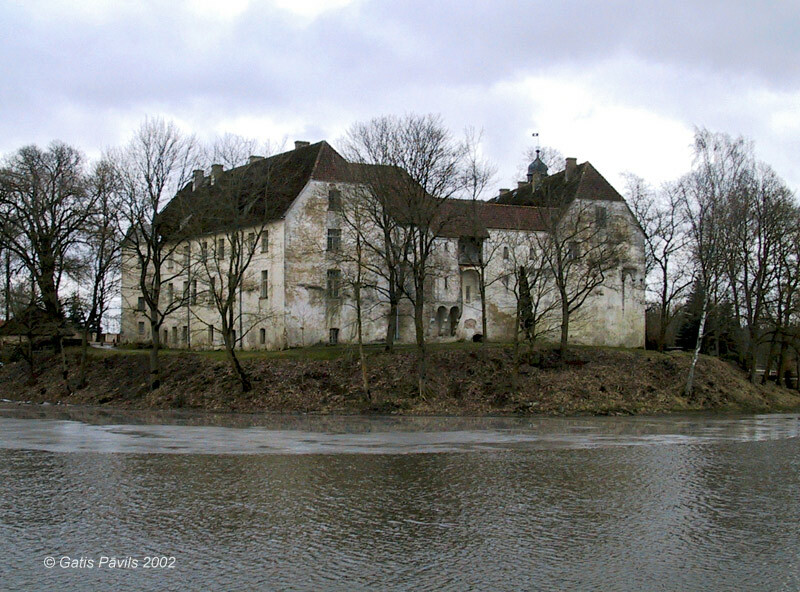 Jaunpils castle is surrounded with waterbodies. It has been constructed on a small peninsula - Jaunpils mill pond surrounds it from three sides. In the fourth - eastern - side in medieval times there was made a moat which was filled up in later times. Castle is shaped in plan as an irregular quadrangle. According to data of B.Schmid (1921) the castle is 40,5 x 29,6 metres large. In 15th century in the southern corner of the castle there is built rounded tower with diameter 11,5 metres. Initially castle had two blocks in south-eastern and south-western sides, both other sides had just a defensive wall. Those blocks had two floors, ceiling was made with horizontal wooden balks. Below these both blocks and rounded tower there are basements. Thickness of walls exceeds 2 metres. In 17th century outside the defensive wall there was built a new apartment block, small gate tower. 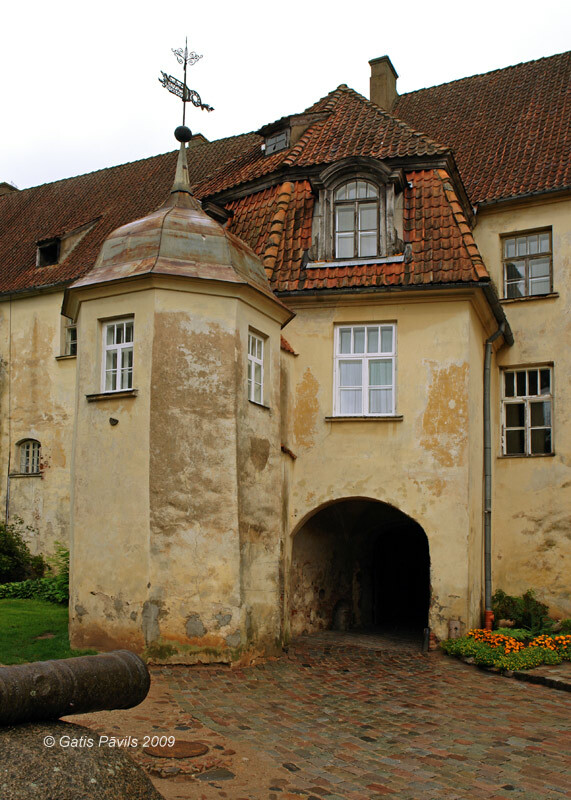 Main entrance was in the middle of south-western wall - part of these gates is seen in the wall of the castle behind the annex of 17th century. Here still is seen a hollow in the wall for the oaken beam, which held the gates from the inside. 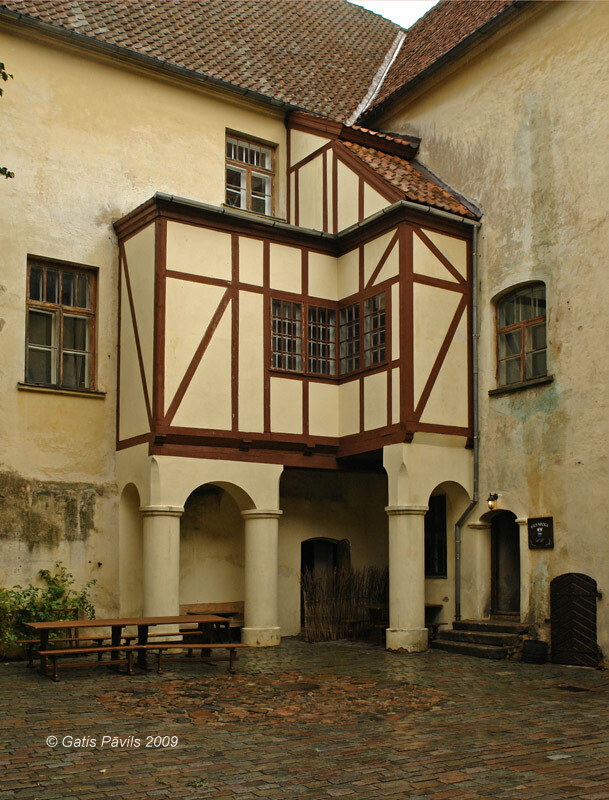 Most likely in 17th century there were built also galleries in the inner yard and ascent to the second floor, walls of the castle were plastered. Width of the current gate - 2,88 metres. Castle is built from boulders, upper part of walls contains brick as well. Plan of the 1st floor. During the renovation works in 1906 there was removed a kitchen house at the north-western wall. The earlier image of the castle in general was retained but several rooms were modernised in order to provide more comfortable living conditions. There still have been preserved Big and Small Halls, Room of Elise, Blue Room, wine and beer cellars, room of the fireplace. Valuable monument of art in one of the rooms of the castle is marble relief "Madonna with child", which most likely is shaped in 19th century (4). Other sources consider that it is shaped in 16th century (2), (3) - ie. belongs to Rennaisance art. Leafs of doors are adorned with Barocco styled panels and rims, made in 1906-1907. 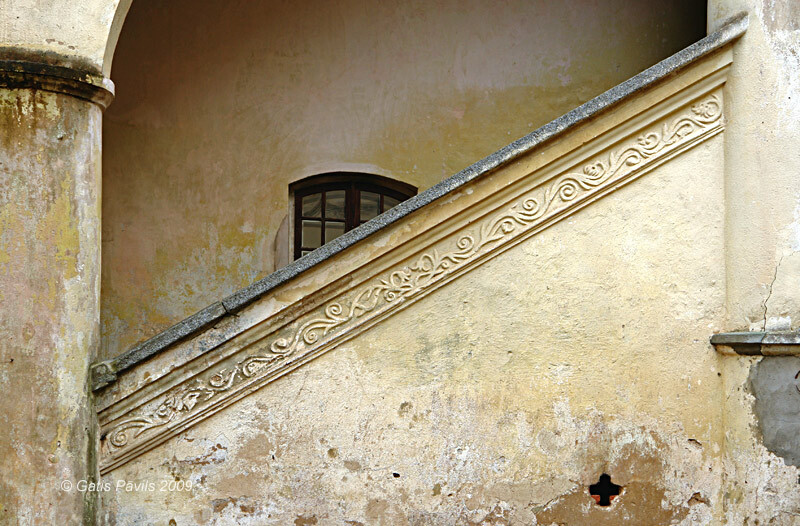 Banisters of stairs, rosettes and profiles of ceiling are made in similar style. 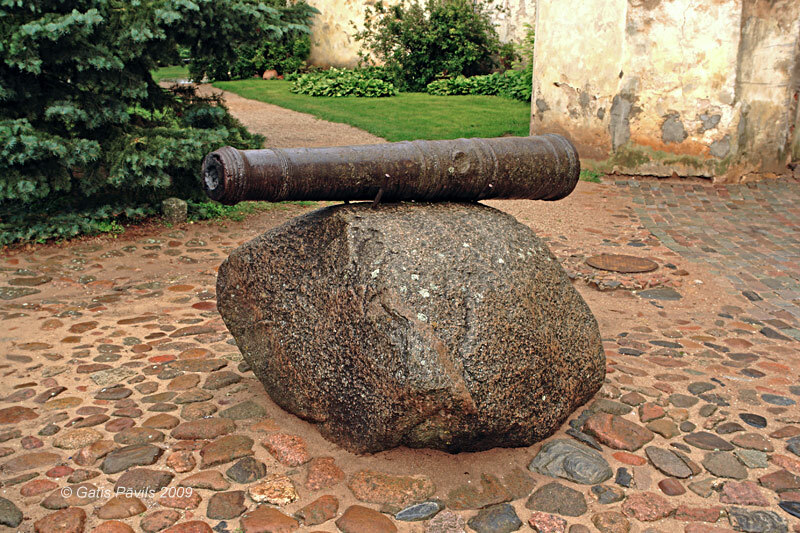 At the entrance in the castle there are two cannons from 17th century. There has been preserved also the medieval balcony of toilet. In the times of knights in Jaunpils castle there was governing baron von Recke. He was a tall and strong man. Recke ordered to build a castle - similar to other castles of knights. 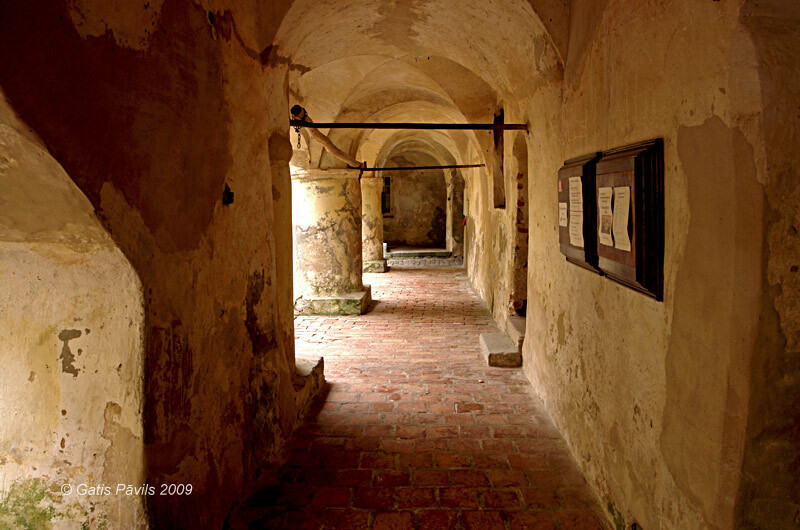 There were built also two underground passages. One was leading to Jaunpils Elles Hill (Hill of Hell) - here were living devils, Recke himself was a devil. Other passage was leading to Sparvas cemetery. View on Jaunpils castle in beginning of 19th century. For his heroic deeds during the war with Swedes Matthias von der Recke had granted the rights on Kabile estate. When Matthas died, his sons could not find any documents regarding the donation of Kabile estate - and thus they had to give up the rights on it. Nearly two centuries passed and one of barons of Jaunpils had money difficulties. He sold several estates, some were mortgaged. Then it happened that one evening at the castle there arrived a knight in full armour (by that time there were no more knights with armours around), entered the castle, went straight to the baron and... handed over to him the long lost document about the granting of Kabile estate. This was the ghost of Jaunpils castle - the one who always helps out in hard times. Thanks to him the castle is in such a good shape today. 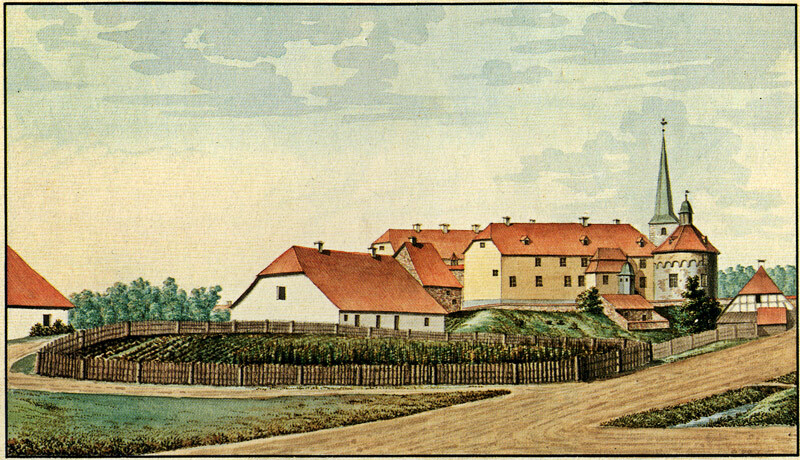 Castle and centre of Jaunpils in the beginning of 19th century. 1974 - E.Kalnins, project for reconstruction, survey. Spārītis O. Jaunpilī. Dabas un vēstures kalendārs' 1985. Rīga, 1984. Zilgalvis J. Pearls of Latvia. Full color guide to 40 of the most beautiful castles, palaces and manors in Latvia. Rīga, 2000-2001.